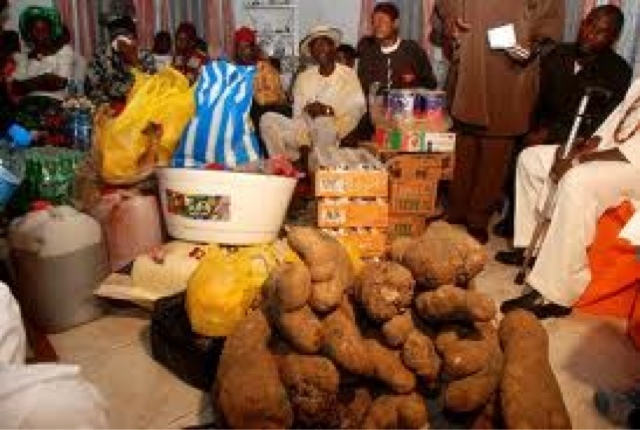 "HUSBAND, PLEASE GO AND PAY MY BRIDE-PRICE!" Wonders will never cease! I just don’t understand how some men reason! How can some men at this time and age, shamelessly be ‘farming’ on a land that is not rightfully theirs?! Please tell me! After listening to my friend today, I was too shocked to advice her. But advice her on what?! If you see this my friend, she is so beautiful. Even though she is a few years older than I, you wouldn’t believe she has a teenage child, talk less of dropping one child. In short she has been cohabiting with the man. I had to ask her what her family members are saying about this and she said they had abandoned her since they didn’t even approve of the man right from day 1. She said she thought it was just her parents trying to prove difficult but they had obviously seen how irresponsible the man was going to be in carrying out the marriage rites. The worse part is that her ‘husband’ is now misbehaving seriously even when he knows he has not dropped a dime on her head. He beats her, sleeps around, smokes and drinks alcohol. He even stays out late to come home the following day. The idiot recently moved out of their home to join another girl. You know what is paining me about the whole thing? The fact that my friend already has 4 children for him ( 2 boys and 2 girls). You mean after she had the first 2 kids, wasn’t that the time she should have questioned his agenda for her?! I don’t get it. It is now she is telling me this gist when things have fallen apart. Now you see this fool don chop belle full! Tomorrow now, when this children become something in life, you will then see him claiming paternity. Shioor! But this my friend no try at all! At least she should have insisted on one type of marriage. What do you honestly advice she should do? When I would have offered my advice, was when she just had her first child but as she no come tell me…she is highly on her own! This entry was posted in Agony Mails. Bookmark the permalink. The woman should be patient,she should believe God and trust Him.She can get in touch with the foundation my wife coordinates in case one of the children can be placed on sponsorship,.She should refrain from having any relationship with any man you know what I mean.But a widower may come on her way ,who would be a God sent,not only will he accept the woman ,but will also adopt the children. Please let's not blame the woman the situation is blaming her already. Stay blessed. Stupid guy! But is d woman daft? !